Transatlantic Love Affair is best known for taking classic fairy tales, such as Cinderella or Little Red Riding Hood, and transforming them almost beyond recognition, using them as the framework in which to tell a more modern and relevant story. In Promise Land, the story of Hansel and Gretel becomes something much larger and more timely when it's re-imagined as the story of two children leaving their home and coming to America to make a new home for themselves, through all the hardships and scary monsters they face along the way. As with all of TLA's shows, Promise Land is incredibly affecting and completing transporting, but this immigration story seems even more urgent and relevant since January 20 (as does pretty much everything). 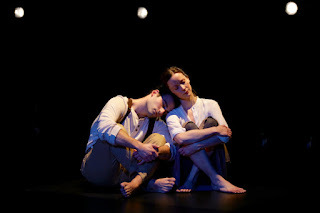 Under the direction of co-founders Diogo Lopes and Isabel Nelson, the show was created by the nine-person ensemble. Happy but hungry children Sara (Emily Michaels King) and Joseph (Avi Aharoni) are sent to America by their loving parents (Emily Madigan and Gregory Parks), who no longer have the means to care for them in their unnamed impoverished country. Once in America, they make their way to a boarding house run by their mother's friend, full of the hope of making a new home and sending money home to their parents to join them. They soon find it's not as easy as that, with unsafe working conditions for both siblings, but they stick together and cling to their hope. Before they left home, their mother told them "it will be hard, but it will be worth it," which they repeat to each other like a mantra, like every immigrant's mantra. It never ceases to amaze me how quickly a Transatlantic Love Affair ensemble creates a clearly defined world and characters with nothing but their bodies, voices, hearts, and souls. In this case, the wonderful, playful, emotive ensemble (which also includes Peyton Dixon, Julia Gay, Eric Marinus, Gregory Parks, and Allison Witham) is the waving ocean, every corner of the ship, the hissing factory machines, a blazing fire, creaking doors, and more. The ensemble receives some help in setting the mood and tone of each scene, both from the lighting (by Michael Wangen and Mary Sabatura) and live music (Emily Dantuma on cello with some super cool looping effects, and also leading the cast in singing traditional Croatian, Yiddish, and Czech folk songs). 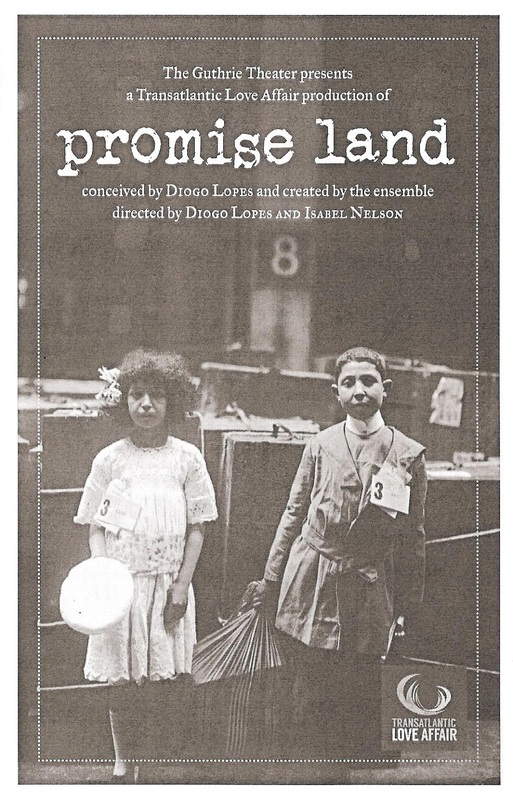 Promise Land was a beautiful and poignant conclusion to a busy and eventful weekend. The world was busy responding to and protesting the 45th president's executive order banning immigration from certain Muslim countries, and I was busy at the theater, art that turned out to be incredibly relevant to what's happening in the world right now. I began my weekend with a backstage tour at the Children's Theatre, where they're working fast and furiously to open their world premiere new musical adaptation of Dr. Seuss's The Sneetches on February 10. A project 3+ years in the making, the story of moving beyond prejudice to friendship with people (or Sneetches) we first perceived as different from us couldn't be happening at a better time. After that I attended opening night of Mu Performing Arts and Park Square Theatre's collaboration on Flower Drum Song, a quintessentially American story of Chinese immigrants told in the quintessentially American art form that is musical theater. Also incredibly timely is Illusion Theater's new play Miranda, in which CIA operatives in a war-torn Muslim country work with the people of that nation to try to achieve peace and an end to violence. 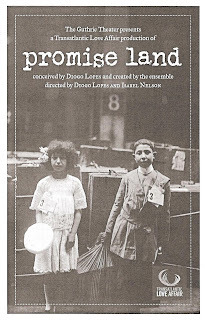 And finally, Promise Land, a story that makes the immigrant experience so real, so human, so moving, so palpable, in the way that only TLA can. This weekend only served to reinforce that now is the time when we need theater, we need art. Theater is more than escapist entertainment, it's a way to tell the stories of people whose stories don't often get told, to gain greater understanding of our fellow humans, to shed light on injustice, to start conversations. On last night's SAG Awards*, departed actor Alan Rickman was quoted as saying, "Actors are agents of change. A film, a piece of theater, a piece of music, or a book can make a difference. It can change the world." Promise Land continues at the Guthrie Theater through February 12, with all tickets just $9. *The SAG Awards were full of inspiring moments, culminating in my long-time favorite David Harbour's truly epic speech about what it means to make art and what it means to be human - watch it here. Thank you for sharing! I'm planning on watching Promise Land and Flower Drum song this weekend. I agree that they're both timely and relevant, and I'm excited to experience them both!